Your life… set to music. For today’s post I will review one of my new road warrior toys. Full disclosure: I do not own an iPod, but I have used them from time to time, but never on a long trip. I am familiar with the new iPod features and interface details. I like the iPod. It is a revolutionary product. My interest in the DJ was driven by 1. battery life and 2. cost. Any review must unavoidably compare the Dell DJ to the iPod. I travel quite a bit (about 40% of my month). Many of those trips are flights to Japan, which are 8~10 hours. Prior to owning the DJ I made the progression through 64Mbyte flash player, CD-based RioVolt, and finally using my iPaq PDA and SD cards to carry MP3 music. My iPaq lasts about 6 hours playing MP3s and using the screen: not enough and storage is limited. First impressions: The unit is smaller than I expected, this surprise comes from reading the iPod-o-sphere complaints about size and weight. 1 oz and a few mm has no impact on me. The unit comes with a sling holster (just like the iPod), REALLY crappy earbud headphones, a wired remote (nice), world-voltage charger (thank God), USB cable, docs and software. My unit was almost fully charged (it had the newer firmware already installed), but I dutifully plugged it in for several hours just to make sure per the manual. Upon power up, the unit is quite pretty, in a high tech way. The front and side power buttons glow a deep blue. I dare say the DellDJ is better looking than the iPod when the buttons are lit (heresy!) The same electroluminescent blue is used for the LCD backlight, and here Dell did well to blatantly rip off the iPod with nice Helvetica fonts and good sized LCD. Here is a pic I took in low light to try and (poorly) capture the effect. Interface: I am a southpaw, and I believe the mundane dell scroll wheel to be more usable one-handed than the iPod wheely-bob. Don’t get me wrong, the iPod is more fun to play with from a sheer joy-to-use factor, but the Dell is easier to use one-handed IMHO. Back/Play-Pause/Next buttons are oversized and easy to find in the dark. The wired remote mirrors these ergos. Volume is easily accessible with side buttons. The on-off button takes a good 2-second depression to toggle, and that makes it seem long. I could go into petty details about how artist/genre/albums are selected, but let me make one simple request for future firmware versions: I should be able to drill down into albums after I select a specific artist. As it is right now (I think), I can only select an artist and then must choose from all of their tracks. If I want a specific album, I must browse specifically by album name. This can be tricky when you have over 600 different albums represented on your player as I do. 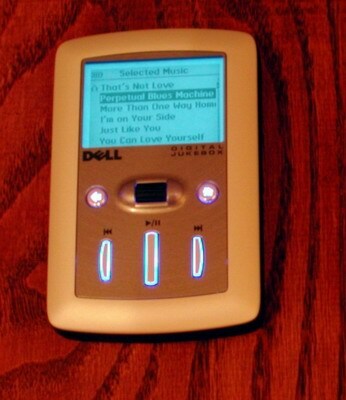 The Dell does not have any games or PDA-like functions like the iPod. I already have a great PDA for these jobs, so no loss. Software: It cant all be a bed of roses, eh? Now listen here: I like MusicMatch Jukebox. I was one of the first people to pony up my $20 for the full feature version. Its one of the best programs available on the PC to manage large MP3 libraries. However, there was a mistake made on the software for MusicMatch -> Dell DJ. Unfortunately it does not transfer the track # correctly on the ID tags. Therefore your tracks on the DJ will not play in Album order automatically if you desire. And I do. Do not despair, there is a workaround: a spunky little company called Red Chair has a program called Dudebox, which solves this problem and enables a host of other cool features on the Dell DJ. HIGHLY recommended. The DJ of course can be used as a hard drive. It works fine for this purpose, and my USB 2.0 connection got about 38-40 Mbit/s real transfer rate. Thats pretty good. BONUS feature: The unit can charge off of the USB connection as long as there is at least 25% charge remaining. I was unaware of the feature and was delighted to discover it. It will NOT charge if you are transferring files, by the way. Using a 20 Gig jukebox: the staggering availability of your entire music catalog makes using playlists even more important. You can instantly transport yourself to nostalgia blasts of pre-teen days (Steve Miller for me), high school (early 80s), college (late 80s), and beyond that chronicle the salient periods of your life. The joy of this abundance amplifies the time it takes to peruse your tracks. Another recommendation: most people have current tracks that they have most recently purchased/downloaded, there should be some way to browse most recent tracks in the library. The Good: I really like this unit so far, the battery life seems excellent and the construction is solid. $100 cheaper than equivalent iPod. Dell specified quality into this unit. The Bad: Headphones are poor. Get some Bose, Sennheiser, Sony, whatever. The Ugly: The driver problem for Track # on Musicmatch is inexcusable. I recommend Dell put pressure on MM to fix it ASAP. Bottom Line: for us world traveler types, these jukeboxes are a must own. I highly recommend playing with the Dell before you buy an iPod. You just might be surprised. I can honestly say recommended. I’m subbing for Director Mitch over at WindowManager. Check it out for a glimpse into high tech marketing. Lots of times I’ll carry 2 matter separators which complement each other. 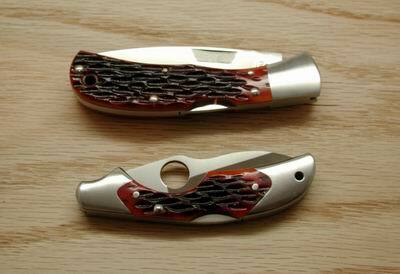 Options include: plain + serrated, large blade + small blade, hollow ground + flat ground, straight edge + curve belly. But sometimes it’s purely aesthetic. These aren’t new, but I thought the colors were good for autumn.